Cool I'll check in my changes now then. I'll fix them later if any bug arises. Hmm.. so it's for IK. I noticed it's also designed for keeping animation more splined oriented. I guess it works kinda. But that makes animation files really huge though. Maybe we can have some sort of post process optimization. Like skip certain key frames if their changes does not exceed a certain threshold. Maybe using some sort of delta graph filtering. - Added some options for OgreXMLConverter to make it easier so one won't have to use the command line arguments. - Beautified the UI a little to make them look better in Rounded theme. There is any plan to export material script, with normal, alpha_blend, etc...? As of now, I don't plan to do anything with material exporting. Reason being for one, I'm not using it. And second, materials are usually application specific. Things like integrated shadow, normal map and environment map usually requires custom shaders. Hence it's something I don't plan to add right now. IMHO, Unless ogre comes with some sort of real defaults, I practically find the material generation useless and deceiving. That's odd. Could you email me the blend file so I can reproduce this? Never mind. Found it. Updated. Just redownload link. or should i downgrade the blender and ogre in order to run properly? I believe your problem lies in that your arm bones are not connected to your spine bones. So they ended up as root bones that are offset to the origin. If I understand how Ogre works, you must have all your bones connected to the parent bone. Hey lefthand! Nice work on the improvements! I just have one little problem: I used to use the old exporter till now, where I used the rotation options in the old exporter to rotate the model -90 degrees around X (to make Y up) and 180 degrees around Z.
Flipping to Y for up axis in this new exporter is fine, but an additional 180 degree rotation around the Blender Z axis is required for proper Blender to Ogre coordination conversion. I went though the code but I was lost. Can you tell me how I can implement this change? Thanks. Hey, thanks But are you sure about that rotate 180 around Z thing? Sounds like your mesh was originally facing the wrong direction. What should be done is when modelling, treat Y as the facing direction. When exported, it will be facing -Z. In opengl matrix, facing direction is always -Z. Camera, Light follow this. If you want to use +Z, just make sure your mesh face the -Y direction before exporting. lf3thn4d wrote: Hey, thanks But are you sure about that rotate 180 around Z thing? Sounds like your mesh was originally facing the wrong direction. Ah ok. You're pretty close. However, I think you shouldn't be negating X. Also the rotation needs to be fixed too. Check out the dot scene exporter that came prepackaged with my release. It does what you want. lf3thn4d wrote: Ah ok. You're pretty close. However, I think you shouldn't be negating X. Also the rotation needs to be fixed too. Check out the dot scene exporter that came prepackaged with my release. It does what you want. I've done that, but I think I'll have to stick with my current way of doing things because I'm in the middle of a project, and I wanted to switch to the new exporter. The thing is, that I edit meshes, and the scene together in the same .blend file, giving a WYSIWYG image of the final level. It would be best if you can tell me how I can rotate around Z by 180 degrees while exporting? That would fix it. I'm sorry for taking your time. There's no need to include this change in the official version, I'd just change mine. Or, you could add an addition option to specify the rotations like the old exporter. I had always taken -Y as Blender forward. Ok, I've converted everything to accept 'Y forward' coordinate system, its working well. I just have another little request (I'm bothering you too much, am I not? 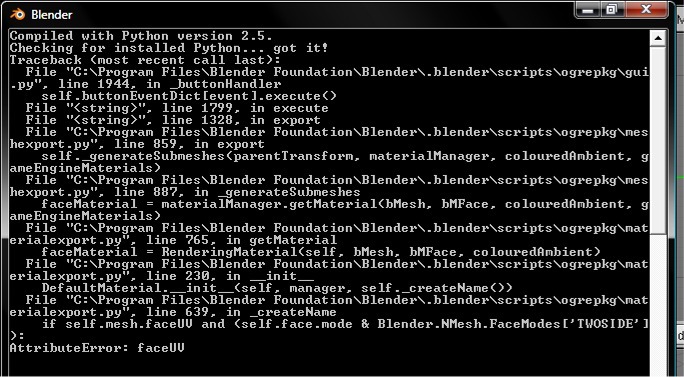 ): Making the material name default to the Blender scene name. I understand that this feature is very application/user-specific, so I understand if you do not add it to the exporter, but I'd like it if you could tell me how to add it myself (the code is too big, I can't find anything ). Actually that's a rather acceptable request. I'll try to find time to add that option in as a toggle button. lf3thn4d wrote: Actually that's a rather acceptable request. I'll try to find time to add that option in as a toggle button. ps. I love how the 'Help' button takes you to the Ogre Forums' search page. 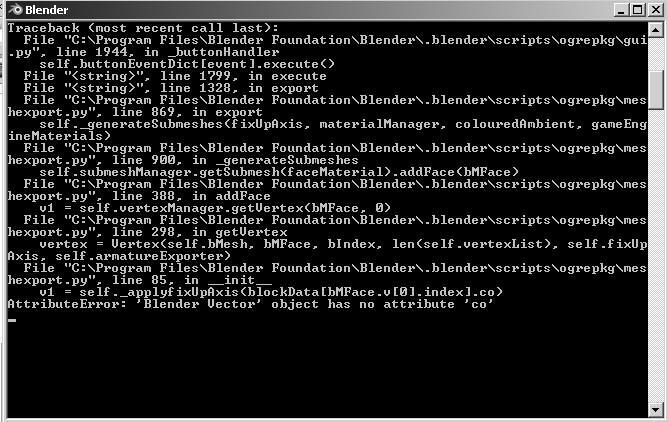 I use blender 2.46 and the last patched exporter (the one you posted the last 4th June). I am trying to export an animated uvmapped parallelepiped with an armature of 4 bones. But I get the following python error. Ah.. material export problem. I've not tested material export for some time. Looks like there's some old obsolete code there. I'll fix that and post up a new update soon. Thanks for reporting. For the moment, you can just disable material exporting. I am in a project where I need to create a character for ogre (1.4.9) , using blender. does the exporter support b-bones ? does it support bone driven shape keys ? My rig is relatively complex, should I try to export only the deform bones, or will it be happy with all the handles and little intermediate bones, that use blender specific constraints ? Does the armature have to have the same center as the mesh ? 1. Umm.. isn't b-bone just a method of drawing the bone in blender? 2. From my understanding, shape key is not the same as bone deforming in blender. Unless you bake the bone deform into the mesh's shape key. Then yes, that's possible. 3. You should only export nessesary bones that actually manipulate the mesh. Constraint bones has nothing to do with Ogre. When exporting, the exporter bakes the bone animation anyways. That's why IK works too. 4. No, AFAIK, this should never be a problem at all. Guess I'll segment the bones into sevral smaller ones to achieve the twist effect. About which bones are exported, I noticied that only 'deform' bones go eported, and that is cool ! Thnak you for your answers !